If you are new to this process of writing a narrative-style college application essay, let me clue you in to why problems are your golden ticket. I believe the best and most effective essays are those that showcase one of your defining qualities or characteristics. And you do this by sharing real-life experiences, moments and events from your past that illustrate (serve as examples for) the quality or characteristic you are writing about. This will start to make sense once you learn more about these essays. It’s important to understand that college applications essays, especially personal statement style essays used for The Common Application and other “core” essays, are very different from typical papers you wrote for English class. These essays, at least the best ones, are highly personal. There are many ways to land upon a “topic” or theme for your essay. You can start by brainstorming your defining qualities or characteristics, and go from there. In this post, however, I’m offering another possible route to finding your best stories and topics. It really doesn’t matter how you find your topic, as long as you unearth one really good one. What you are looking for are those experiences from your past (mainly during your high school years) that you can share in order to reveal what makes you tick, what you most care about, how you learn and what sets you apart from other applicants. Ready to find your best moment, experiences, events and incidents? Start looking for past problems. Find a juicy problem, and you will have a little story. If something happened, that makes your essay interesting to read. It also means you had to deal with something; you had to handle that problem. This gives you more to write about yourself: How you felt about that problem, the steps you took to manage it, and most important, what you learned (about yourself, others and the world) in the process. Boom! You will have a personal essay about yourself. But first, find a problem. They do not need to be impressive, momentous, catastrophes or tragedies, although those can work, too. Often, the most simple, everyday problems work the best. The beauty is that we all have faced many problems, big and small. Everyday, all day. It’s call life. Anytime anything “happened” in your life, it involved a problem. Problems come in many shapes and forms. Go down this list of problems and write down “times” you faced or dealt with this type of problem. Try to think of one big example and one small one. Often the smaller ones turn out to be the best ones. When did you face an OBSTACLE (something got in the way of something you wanted)? What has been one of your biggest CHALLENGES (something hard for you)? Did you have a CONFLICT with someone (you disagreed on something; you both wanted the same thing; you argued…)? Was there any big CHANGE in your life (you moved; you lost a loved one; you looked different)? Did you make a MISTAKE in recent years? Has anything happened to you that was a SETBACK in your life? Did you FAIL at anything? What is your main FLAW–physical or emotional? What made you feel the most FEAR? Does anything make you feel GUILTY? Does your family have any HARDSHIPS (financial; addiction issues; immigration status; job loss)? Do you WORRY about something? Is there something you REGRET (wish hadn’t happened or would want a redo)? Do you always get into the same kind of TROUBLE? I hope this has helped you collect some of your recent problems. Now, check if any of them are particularly unusual, unique, memorable, entertaining or interesting. HINT: Stay away from cliche school “problems,” such as getting a bad grade, blowing a test, sports injury, etc. Problems that only you can have most likely are your most promising problems to start your college application essay. Here’s another trick to fleshing out a juicy problem: If you found a “big” problem, see if you can find smaller examples of that problem, in the form of smaller problems. Example: Big problem = Your mom got very ill. Smaller problem = You have to care for your three younger sisters. Maybe you didn’t know how to cook (an even smaller problem related to that big problem), and now have to make their lunches every morning or make dinner. Maybe your little sisters are all picky eaters (another problem! ), and you have had to get really creative in making them lunches they will eat. Hey! This could be an excellent essay: Write about how you make fancy lunches for your picky little sisters. Could such an ordinary, everyday topic like making paperbag lunches get you into your dream school? Think about what that daily chore reveals about you? If nothing else, it’s that you are highly responsible (a defining quality?) and care a lot about your family–especially if you made that effort to learn to cook, accommodate your sisters’ fussiness with creative (defining quality?) meals and help support your ailing mom and family. That’s quite an impressive person we will learn about—without even trying to be impressive. In this essay, you will of course mention the larger problem of your mom’s illness when explaining why you had to make lunches. Then you can talk about how you handled that problem, including making these lunches and other meals. You can explain the steps you took to learn how to cook, and your defining quality of bringing creativity and personal responsibility to the process. I know this is a lot to take in at once. But once you read some sample essays and start to spot the problems that power the personal stories—and see for yourself how they are interesting to read, and how you get a personal “picture” of the writer—this approach will make more sense. Can you imagine how you could start this essay sharing your daily morning routine of making creative sack lunches? I can picture the types of colorful details and snippets of conversation from those frantic mornings–which you could craft into an anecdote to show yourself in action and start your essay. So I hope my Brainstorm Guide has helped you have unveil some of your past problems to start your college application essay. And that you start to get an idea of how you can use these to write about yourself to start your college application essay. If you take the time to learn more about this process, you can write your own awesome essay. Read my posts in this Jumpstart page and I promise this will start to make more sense, and even give you more ways to discover your best topic ideas. 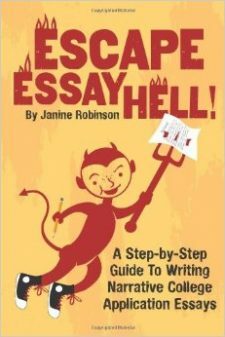 If you want a short book that takes you through this process one step at a time, check out my writing guide on Amazon: Escape Essay Hell! My online course, also available on this blog, does the same thing, but with a series of short videos and handouts. Remember, if you can think of your past problems, you are bound to find a great topic to start your college application essay!